The Turkish Flagship Center’s culture night and informational event began with a lesson in Turkish dancing. Students got up from tables set up around the room and gathered in the front to watch the instructor. The evening also included a variety of Turkish food and the opportunity to speak with other students following a presentation on the Turkish Flagship Program. Rebecca Mueller, program coordinator with the flagship, invited those among the attendees who knew the dances to come up to instruct the nearly 30 other students in the basic steps and formations. Everyone followed the counted steps and kicks after watching a complex routine done by a high school dance team from a YouTube video. The Tuesday evening event, which took place in Hutton Honors College’s Great Hall, was geared toward informing interested students about the Turkish Flagship Program, sharing a bit about Turkish culture and giving reasons why they should consider studying the Turkish language during their time at IU. Turkey is an emerging market economy that acts as a bridge between the East and the West, Mueller said. It is currently the largest economy in the Middle East, and has been significant in the news because of the recent attempted military coup and the open borders during the Syrian refugee crisis. The flagship certification, combined with professional-level proficiency with Turkish language, opens the door for many other career opportunities, including government jobs, NGO positions and many more, upon graduation, Mueller said during her presentation. Similarly, those in ROTC positions may have interest in Turkey because of military connections to the region. Students also have the opportunity to study in Azerbaijan in connection with Turkish study, Mueller said. Jeff Heerdink, manager of the Hutton International Experiences Program,spoke to students about the HIEP grants available to help make study abroad for any location or length of time easier. “If you’re doing an internship, we have a grant for that. If you’re doing research, we have a grant for that. If you’re doing a creative activity, if you’re a fine arts major, we have a grant for that,” Heerdink said. Many grant opportunities exist through HIEP, available to both Hutton and non-Hutton students, Heerdink said. Heerdink said the HIEP grant amounts can range from $500 to $3,300depending on a variety of factors including length of stay. With the Turkish flagship, multiple opportunities exist to travel abroad and include the possibility of a full-year capstone, a conclusion to an area of study that encapsulates all a student has learned in their program. Sophomore Matthew Neuman participated in the IU Summer Language Program in Turkish and joined the flagship in the last year. 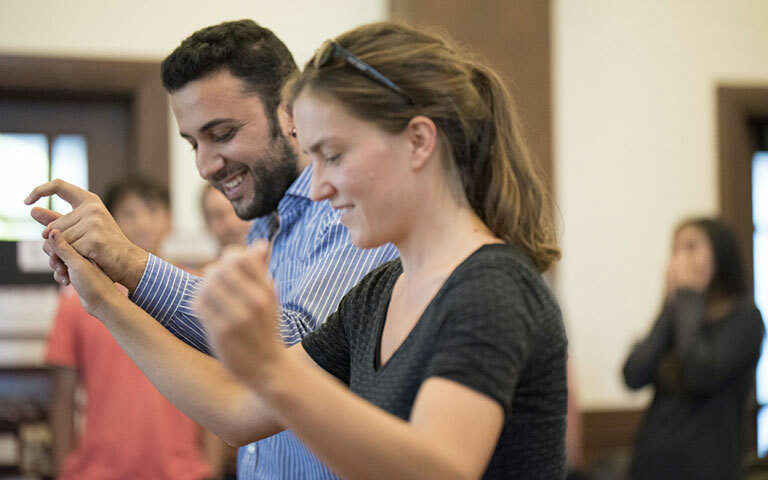 “It’s a lot of fun, and I would recommend it to anyone with an interest in the Middle East or central Eurasia to consider learning Turkish,” Neuman said. Moira Corcoran, a sophomore who has been in the program since last year, said she has appreciated the program and the sense of excitement that comes from the group involved in the flagship.